In the last posting, I covered the first two steps, the start, and the barm. Now, we’re ready to move ahead to the sponge, and, finally, the dough! At this point, I doubled the recipe, so I could make two loaves. That way, I would have some to enjoy, and some to give away, if I wanted. I’m going to post it straight, here, and you can double it if you want to. about ¼ cup warm water, maybe more, enough to make a basic dough texture. I mixed these ingredients together, stirring until all of the flour was combined in, and it was forming a ball. I didn’t knead it, but I did end up mixing it with my hands a bit to add some more moisture and make sure it was incorporated. I covered it in plastic wrap and put it aside, letting it ferment for a few more hours, until bedtime. At that point, I put it in the fridge for a long, slow, cool, overnight rise. I mixed all of these things together and dumped it all out onto the tabletop and began kneading. As always, I added flour as I went, to make it the right consistency (not too sticky, not too stiff and dry). After only about 15 minutes, it passed the windowpane test, and I kneaded a few more minutes just to be sure. I oil-sprayed the bowl and set the ball to rise. A few hours later, it had doubled in bulk (or so), and I pulled it out and shaped it into two boules (remember I had doubled it). Now, this is where I did things a bit differently than I did before. I had some cloth from an old shirt, which I sprayed with oil and dusted with flour. I draped that cloth over a bowl and set the dough boule into the middle of the cloth. I folded the cloth over the top of the dough and set it aside to proof. I did this with my other boule, too. You’ll see why in a bit. After that had been rising for a few hours, I began preparing the Dutch ovens. I lit up a lot of coals, and let them get nice and white on the edges. I oiled the Dutch ovens and set them up with about 14-16 coals underneath them each, and 26-30 coals on top. That’s right, I wanted these things to be HOT. About a half hour later, when I could see that the ovens were good and hot, and the bread was nicely proofed in the bowls, it was all ready. I brought the bread out to the ovens, set the Dutch oven lid aside, and upended the bowl, dropping the bread into the Dutch oven. Quickly, I pulled off the cloth, and made some fast slices in the top (which was the bottom a few minutes ago), and closed up the lid. Then I did the same thing for the other boule. 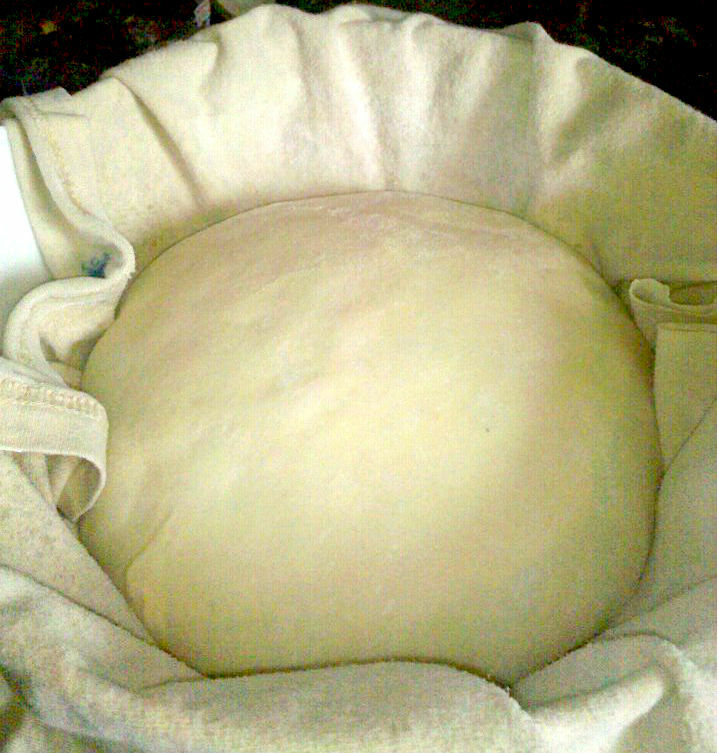 See, the whole “cloth in the bowl” thing made for easy transfer of the proofed bread to the fully pre-heated dutch oven. I didn’t have to mess with parchment, and there was no lag time heating up the base of the Dutch oven or the air inside. After about 15 minutes, I rotated the lid and the dutch oven, and replenished some of the coals, top and bottom. I was very careful on the bottom coals. I added some, but I’m always cautious in how many I add. In this case, I put on four, one on each “side”. Too many bottom coals can make for a heavy bottom crust. I also lifted the lid and set the thermometer. I have these short-stemmed meat thermometers that I really like. It was hard to find them, but I’m glad I did. In about another 15 to 20 minutes, I checked again, and they were done, to 200 degrees. The top crusts didn’t brown very much, so I wasn’t sure if they were done, but the thermometers said so, so I brought them in. I dropped them out of the Dutch ovens and onto cooling racks. The thermometers came out pretty clean, so that was a good sign. I just let them cool for a couple of hours while I cooked the split pea soup with the ham bone from Thanksgiving. The bread, when I finally cut into it, was soft and delicious. The crusts were soft, the bread was chewy and tasty, and done all the way through, it was perfect. Like I said before, it was easily the best sourdough bread I’ve ever made. First of all, a long, drawn-out process of multiple steps of fermentation helps all of the rich, complex flavors develop. It really is worth it to take your time and not rush this process. Look at the ingredients! There’s nothin’ there! No egg, no sugar, no oils, no herbs! It’s just you, the wheat, and the germs! Yet, if you let nature take its sweet time, you’ll get some seriously delicious bread. Second, preheating the entire dutch oven made a big difference in the baking. The cloth-covered bowl made this easy and practical. This was definitely a major breakthrough in my bread-baking learning!